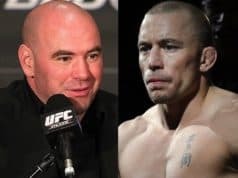 Georges St-Pierre addresses the reason that he doesn’t have much interest in fighting UFC welterweight champion Tyron Woodley inside of the Octagon. The former UFC welterweight and middleweight champion returned to competition in November of 2017 after four years away from the sport to win the middleweight title. The ending of that fight went down with a submission victory in the third round over Michael Bisping at UFC 217. However, shortly after the fight, he had to vacate the title as he is dealing with colitis. The UFC gave the latest title shot to rising prospect Darren Till. This led to Woodley getting a dominant win over Till at UFC 228 earlier this month. 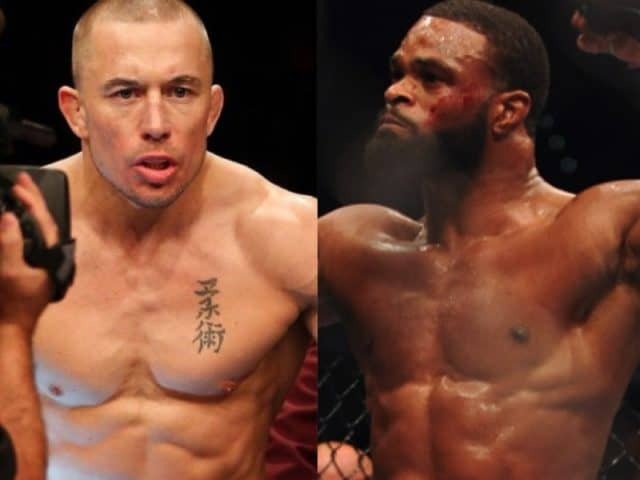 For months, Woodley called for a showdown against GSP. However, that is not a mutual interest as the former champion went on record in a recent interview by stating that he doesn’t want to fight Woodley. “In terms of coming back to fighting, you have to realize I have a lot more to lose than to win. 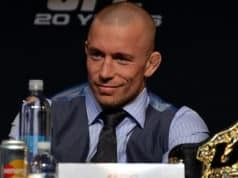 Tyron Woodley wants to fight me because he has a lot more to win than to lose because if he beats me in terms of legacy, in terms of popularity, he has a lot more to win,” St-Pierre explained to FanSided.com. “It’s not that I’m scared, actually, I’m always scared when I go fight, I’m scared of everybody but being scared is irrelevant because I’m going to walk the walk if I have to do it. I have to choose carefully what is my next move.